Brian Lamb is the director of the School of Music at the University of Central Oklahoma, where he has served as Director of Bands since 2001. In this role, he enjoys providing resources for faculty and students to reach their goals and pursue their dreams. The School of Music is growing and thriving, and Dr. Lamb embraces the challenges of strategic planning and is inspired by the potential of the UCO School of Music as it emerges on an international stage, known for world-class faculty, exceptional students, fantastic performing ensembles and a thriving metropolitan location. He conducts the Wind Symphony, and prior to his administrative appointment, he taught conducting and instrumental music education courses and guided all aspects of the UCO band program. Brian Lamb is the Director of the School of Music at the University of Central Oklahoma, where he has served as Director of Bands since 2001. He conducts the Wind Symphony, and prior to his administrative appointment, he taught conducting and instrumental music education courses; he continues to guide all aspects of the UCO band program. Dr. Lamb made his Carnegie Hall debut in 2005, performing with UCO friend and colleague Tess Remy-Schumacher in the Weill Recital Hall. In 2006, Lamb and the UCO Wind Symphony performed for a full house in the Isaac Stern Auditorium at Carnegie Hall. The UCO Wind Symphony, with Lamb as conductor, has garnered international attention and acclaim from audiences, composers, and critics alike for outstanding and creative performances and for playing an active role in commissioning projects and consortiums, including work with Carter Pann, David Maslanka, Carolyn Bremer, Richard Danielpour, Michael Daugherty, Michael Colgrass, Samuel Magrill, and others. Lamb received the bachelor's degree in music education from Baylor University, the master's degree in trumpet performance and literature from the University of Notre Dame, and the doctor of musical arts degree in conducting from the University of North Texas. He has been fortunate to study with many outstanding musical mentors, including Eugene Corporon, Michael Haithcock, Gary Sousa, Larry Rachleff, Alan McMurray, Jack Stamp, Dennis Fisher, John Haynie, Barry Hopper, and William Scarlett. Prior to his UCO appointment, Dr. Lamb served as Director of Instrumental Studies at Southwest Baptist University and as director of bands and chairman of the fine arts department at James Bowie High School in Arlington, Texas. Still active as a trumpet performer, Dr. Lamb plays in the Redbud Brass Quintet, the UCO Faculty Brass Quintet. 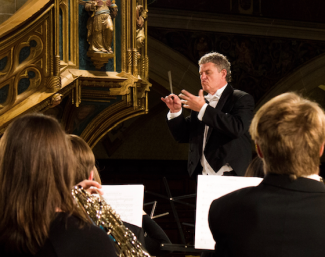 Dr. Lamb is active as a clinician and guest conductor all over the world, and his groups have received acclaim for performances at regional, state and national conventions. He has contributed several published works to various journals and textbooks, and he is the author of "Music is Magic," a children's radio program that aired on KUCO-90.1 FM. He is a member of Pi Kappa Lambda Music Honor Society, the College Band Directors National Association, Oklahoma Music Educators Association, Music Educators National Conference, and Phi Mu Alpha Sinfonia. He was honored as a Friend of the Arts by Sigma Alpha Iota, he is an honorary member of Kappa Kappa Psi, the national band service fraternity, and he was recently inducted into the Oklahoma chapter of Phi Beta Mu.